Frames are not something I give much thought to- its more about the photo- and I certainly have a ton of photos. The shelves and tables in the Maine house have photos arranged everywhere- mostly in plain silver or gold frames- purchased for not much money and most always on sale. 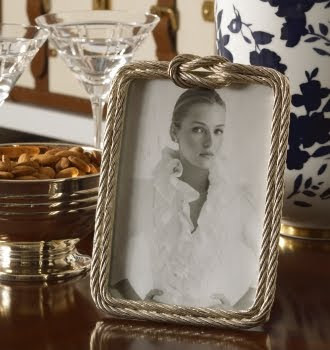 These two frames by Ralph Lauren featured on the website are gorgeous- I especially love the rope frame- so nautical. 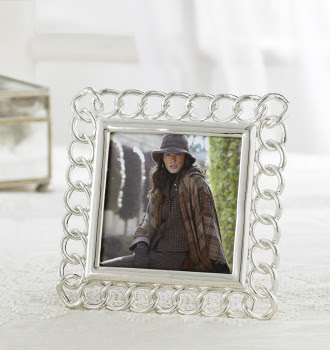 This silver link frame would look fabulous as well- what a great addition to spice up the groupings of plain silver frames. Need to add a few of these to my collection. So excited when I saw this month's House Beautiful on the news stand- A whole issue on BLUE!!! Yea my favorite color and my "go to" for any accessory in the house in Maine and the DC condo! When shopping my eye invariably heads to anything blue- I am always scanning the shelves at Homegoods for anything blue!!! And, it usually finds its way to my cart! Thanks to House Beautiful for featuring the color all over its magazine this month- This house - a beach house in Nantucket is gorgeous, casual and of course BLUE! 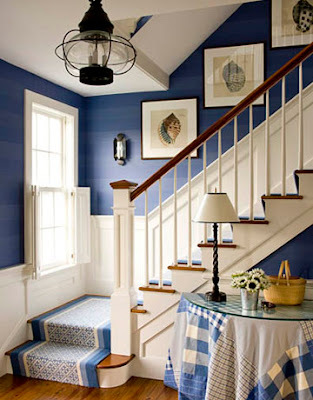 Wall of blue up the staircase looks great- might be good in Maine- but I think wallpaper is the way to go for me. 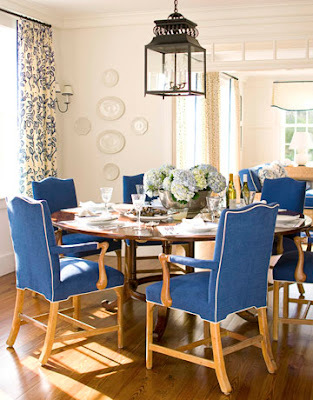 Love these upholstered chairs- how casual - I am also obsessed with corded upholstery!! Love it! 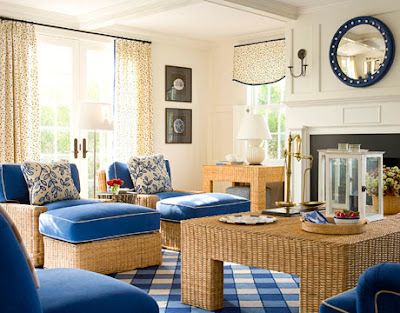 Living room in the same Nantucket house- so comfortable and I love love love that mirror! Okay, now for something a little more upscale and formal. Eventually when we combine both the Maine and DC houses I will be bringing up all my collection of Chinese blue and white porcelain. 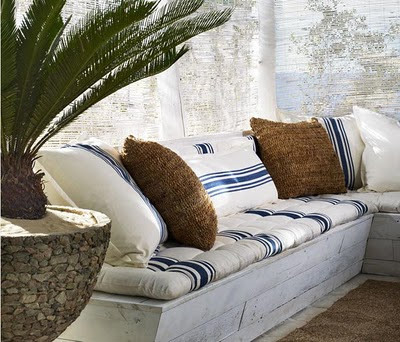 I think it will add a nice touch to the beachy look of the Maine house. 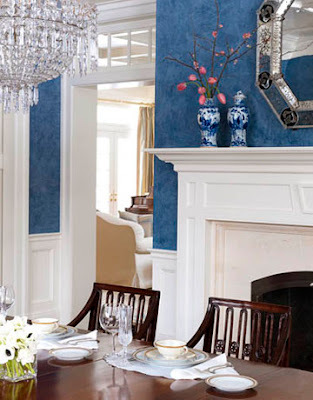 Maybe I should concentrate my blue and white porcelain in the more formal rooms like the dining room in Maine- probably a more suitable place for it. 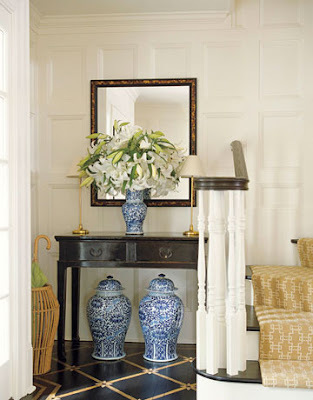 As I said Blue is Back- Ralph Lauren is featuring blue all over their new home collection this spring. This is called La Plage- or "the beach". 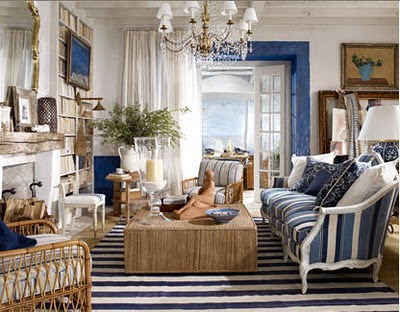 Love the combination of casual wicker with feminine white french - and how about that striped rug- love the mix . Again Ralph Lauren cushions from his La Page collection - would look great in Maine- gotta get shopping!!!! So glad to see blue is back in a big way. Visiting my daughter and son-in-law for a very fun time with my grandson, Gabe! 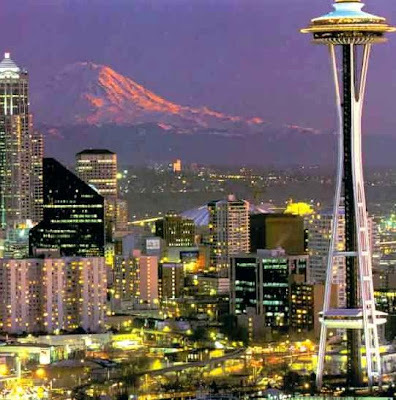 Meg and Jeff are jetting off to Thailand for a great 2 week vacation!! I will be babysitting my almost 3 year old grandson Gabriel Spencer Jones!!!! Having fun but not to much time to blog- back to posting at the end of the month!!!! !